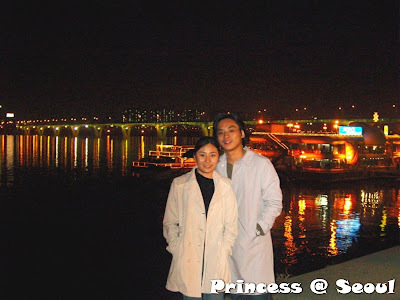 Located to the south of the Han River, this is the most exclusive shopping, entertainment and residential area in Seoul, and very popular with wealthy Koreans. Western style bars and upscale restaurants, rock cafes and top end department stores are found here. Rodeo Street is well known for its hip pubs and high fashion boutiques; it is a favoured haunt of Korean TV and movie stars. What to see and how to go? Namdaemun Market is Korea's oldest open-air market; it has existed on this spot for more than 600 years. As its name suggests, it is located adjacent to Sunglyemun (Namdaemun), and sells virtually everything: clothes, flowers, Korean art works, ceramics, handicrafts, clothing, glasses and imported goods. Namdaemun Market is permanently crowded, and is open round the clock. It is a "must" for bargain hunters. We went to this open market twice. Needless to say, it's a great spot for shopping. Especially when you have limited budget to shop for souvenirs. Oh ya, don't forget to say, "Bisayo... Kka kka juseyo." when you bargain. With large scale shopping malls and convenient accessibility, Dongdaemun Market has recently become the largest apparel shopping area for young Koreans, especially wom in their teens and 20s. There are 30 shopping malls housing 27,000 retail and wholesale shops. While shopping, you can enjoy live performances, fashion shows and other events at the open stage of Doosan Tower, Freya Town and Migliore, the three busiest malls. Dongdaemun jonghap Market is favored by older Koreans. Heunginjimun (Seoul's ancient East Gate), the Changsindong Toy Market and Hwanghakdong Flea Market are also in the vicinity. 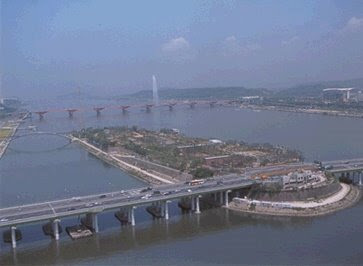 The Han River that runs through Seoul provides a retreat from the skyscrapers of the city. Riverside Parks along the banks of the Han River are a huge flat area with many amenities such as jogging paths, outdoor swimming pools, roller-skating rinks and other sporting facilities. Floating restaurants and cafes add to the fun. Seonyudo is an island park on the Han River where visitors can learn the history of the river, experience an exotic wetland environment, or simply take a rest. Seonyudo Park contains a green column garden, a water purification park, a water plant park and a natural ecological park. Inside the park, there is also the Han River History Pavilion where the origin of the river and changes in the animals and plants inhabiting the river and the banks are displayed. The Park of Time features flowers and plants with different fragrances for each season and a mini-dome theater. 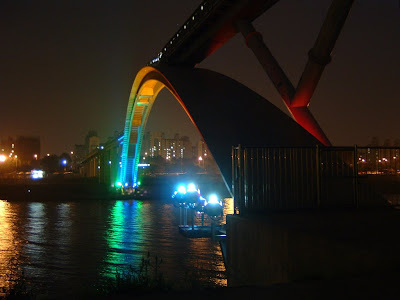 Seonyudo also has a rainbow-shaped bridge designed for pedestrians. This is a vast underground cultural and leisure development encompassing the Convention and Exhibition Center (COEX) and the Trade Tower. This mall houses western restaurants, bars, an aquarium, a cinema complex, a bookstore, and scores of shops and boutiques. It's all about shopping! By the way, I've never seen such beautiful flower decorations in the flower exhibition. This park on Mt. 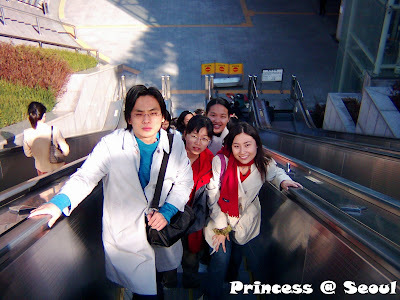 Namsan features a botanical garden, a small zoo and a playground on the lower side of the park. A recommended attraction here is a cable car ride which enables you to get a bird's eye view of the city. Another landscaped park opposite the Hyatt Hotel offers world-class jogging tracks, spectacular views, and a path leading on to the wooded slopes of the mountain. In the vicinity are the Seoul Tower and the Global Village Folk Museum inside the Tower. It was the first time ever that I travelled out of the all time summer Malaysia, thus I could finally get a chance to experience the feel of chilling. 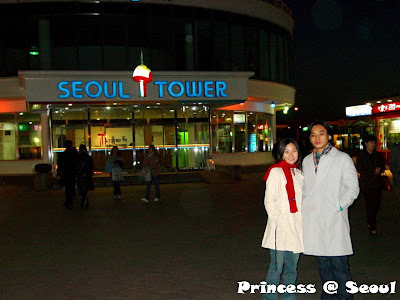 We went up to Seoul Tower only during sunset. Therefore the temperature dropped even lower when we reach the park. I love the spectacular view on Seoul from the cable car ride. You can see it too if you watch "My Name is Kim Samsoon". This park was built on the prison site where Korean patriots were imprisoned and martyred by the Japanese colonialists. 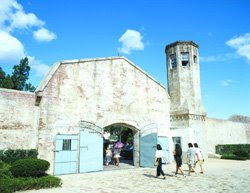 Its main features are the Prison History Hall and Seodaemun Independance Gate. The multi-building prison complex has been turned into the Prison History Hall that houses prison cells, an execution building and a watchtower. The facilities have been restored to their original state, and visitors can experience what it was like to be imprisoned and tortured at the Temporary Detention Room and the Torture Chamber. The Independence Monument was established to honor the spirit of the non-violent civil uprising for liberation from Japan. It has an inscription of the March 1 Declaration of Independence along with the names of 33 leaders who initiated the Independence Movement in 1919. This is Asia's largest soccer-only field with a seating capacity of 64,677. The architectural design reflects traditional Korean beauty and modern technological conveniences. When seen from above, the stadium is confgured in the shape of a giant square shield kite. At night, the roof displays the soft, warm colors of Changho-ji, or Mulberry paper, used to make kites. Huge 25.1 by 9.2 meter high-definition digital screens on the north and south ends of the stadium allow each spectator a clear, unobstructed view of a game.